Yesterday was Nicholas’ birthday. I was running around and wasn’t able to put up a post. He doesn’t like me to put him on my blog anymore so I am refraining from using any photos with his handsome little face in them. So all I am left with are cake pictures. Yesterday he turned 11. Can you believe it? I can’t. It seems like yesterday I was running back and forth to the doctor (I had to be on bedrest) to make sure my baby boy and I were alright. Everyone tells you how fast it goes and you shrug it off but then you blink and your baby is grown. Sometimes I even find myself thinking about how sad I will be when he goes away to college. The self-inflicted torture must stop. Anyway, my inlaws and brother-in-law came over this weekend to help with the continued construction of the studio (what you and I would call a clubhouse) for the boys. They laid the foundation in June and then summer fun got in the way so now they have begun the work again in order to complete it before the bad weather comes. I will post photos soon of the process. It is amazing and I am so proud of my husbands ability to make something so amazing. So since they couldn’t be here on Monday to celebrate. We celebrated with them on Saturday night and then on Monday we celebrated with him and took him to dinner. 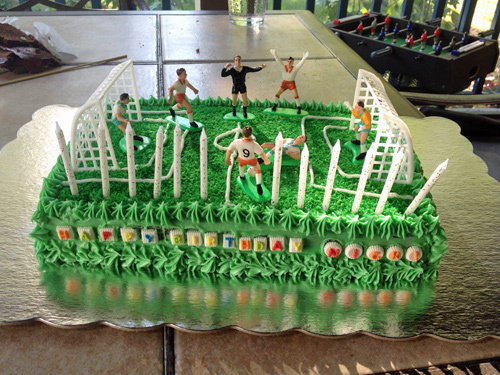 My mother-in-law made the cake. Now you all know I love paper crafts, knitting, reading and gardening. 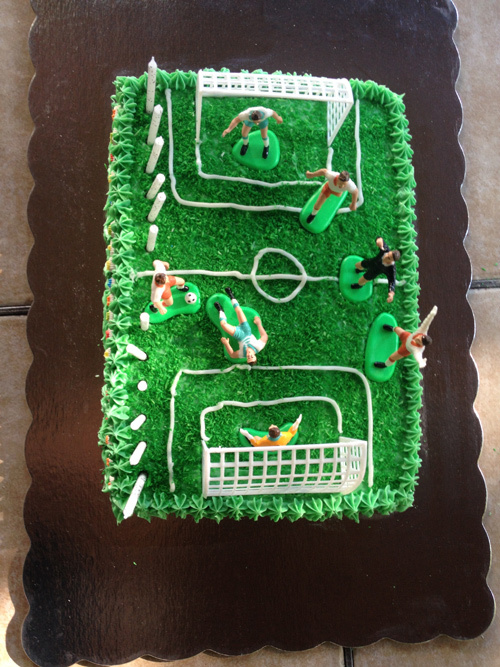 But making a cake and decorating it…well let’s just say, I leave that to the professionals. 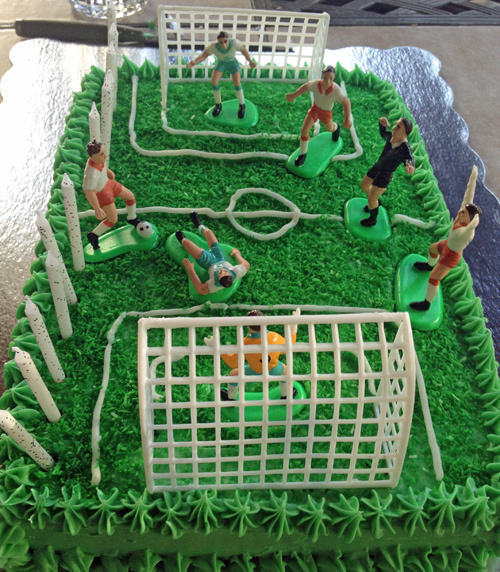 So she made the cake and decorated it with this soccer theme. It was so cute. I wish for Nicholas a year full of fun adventures, growth and a lot of love. I am going to go snuggle up with a book today because it’s one of those crawl under a blanket gloomy days outside. Next PostHappy World Card Making Day (WCMD) 2014!! Previous PostA Peek Inside: Coloring, coloring and more coloring!! They do grow up so quickly!